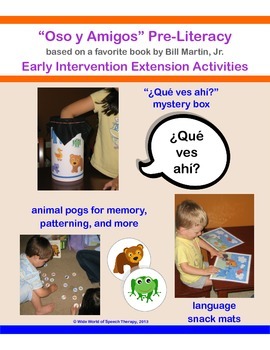 For Early Intervention practitioners, preschool teachers, parents, and grandparents working with SPANISH-speaking children. 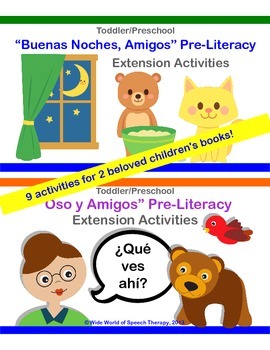 Based on 2 beloved children's books, this 9-activity pre-literacy pack includes book-related extension activities for ages 18 months to 3 years, and beyond. 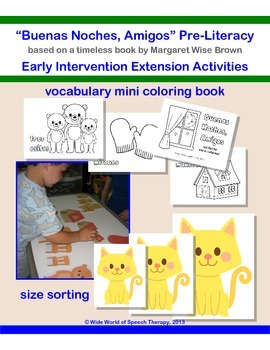 *Please note: if you have purchased the English version of this product, you will notice a slight change in the coloring mini-book activity. 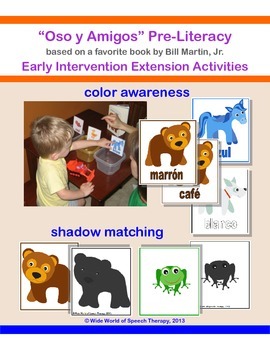 Because the story elements do not rhyme in the Spanish translation, the rhyming component of this activity is absent. Price difference between English and Spanish is reflective of this absence. To see thumbnails enlarged, plus additional images, click on Preview button above. I hope your clients and children enjoy these activities as much as mine have!